Dr Naomi Roux has been selected from a highly competitive field of applicants as the holder of the next Ray Pahl Urban Studies Fellowship. She will spend 2016 at the ACC. Dr Roux will use the year to develop her PhD (Birkbeck, London) into a book about memory and urban spatial transformation. Her case study is Nelson Mandela Bay Municipality (Port Elizabeth), South Africa. Her work there examined links between post-apartheid urban transformation and the accompanying official and unofficial constructions of public memory and heritage. Specifically, Dr Roux’s research probes the extent to which ephemeral forms of collective memory and heritage hold potential for alternative, participatory memorial practices. These in turn allow for multiplicity, divergence and productive conflict. Key ideas are that the city is a potentially democratic space, both politically and in the sense that urban space is a text and archive authored collectively by its inhabitants. Dr Roux’s research is grounded in case studies about the Red Location Cultural Precinct in New Brighton, the South End Museum and heritage trail, the Amabutho (former youth activists) and the politics of public art in the Port Elizabeth city centre. Her findings are that while official memorial interventions may be rejected or contested, narratives of memory left out of these processes find their way into public space by alternative means. 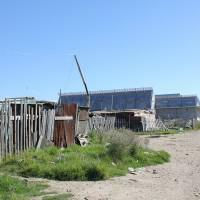 Few memory sites initiated by the city council or provincial government in Nelson Mandela Bay Metro have been embedded successfully in the everyday life of the city, or those who live alongside these monuments. Yet, this absence of memorial practice does not imply an absence of memory. In many cases, occluded memory is reclaimed and inscribed back into the urban landscape ephemerally, through interventions such as performance, walking, or the spoken word. These suggest the possibility of a practice of memory which is participatory and fluid, taking account of the multiplicity of interwoven memories and voices in urban space. Dr Roux’s research poses potent questions about democratic urban agency.